H.M.S. 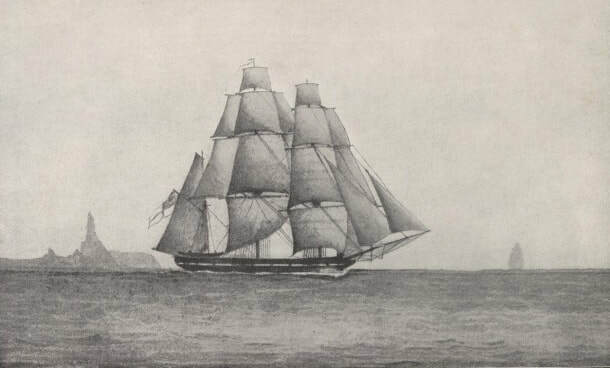 Beagle from a sketch by Darwin's shipmate John Clements Wickham. Many of the crew from that voyage (Wickham, Stokes, Fitzmaurice & Forsyth) were still with the Beagle for the Third Voyage which furnished Admiralty Charts of much of the Australian coast and made discoveries including Port Darwin - the Fitzroy, Adelaide, Victoria and Fitzmaurice Rivers - the charting of Bass Strait, the north coast of Tasmania and the southern coast of Victoria together with the entrance and significant areas of Port Phillip Bay. Charles Darwin had been with the Beagle surveying southern Australia but was no longer among the ship's company when, on 27th July 1839, Commander Wickham anchored her in a broad bay off Clarence Strait - which he named Adam Bay - at once dispersing his men to search for a great river to carry exploration into the dark interior which would not be crossed until John McDouall Stuart reached the north coast at Chambers Bay on 24th July 1862. "Impatient to learn the truth, Mr. Fitzmaurice was despatched to examine the head of the bay, whilst the ship was moved towards it, anchoring again one mile North-West from a very remarkable patch of low red cliffs (which from startling circumstances, hereafter to be related, were called Escape Cliffs)……On returning to the ship we found that Mr. Fitzmaurice had arrived, bringing the expected, and very gratifying intelligence, that a large river with two branches, running South-East and South, with a depth of four fathoms, emptied itself into the head of the bay." They had discovered the Adelaide River which they named for the Queen Dowager and Adam Bay for Vice-Admiral Sir Charles Adam. It was to become the site of South Australia’s first attempt at a Northern Capital for its Northern Territory and would be called Palmerston - the original name for Darwin City & today the name of her satellite city. Sagas of triumph & disaster - not without their lighter moments. 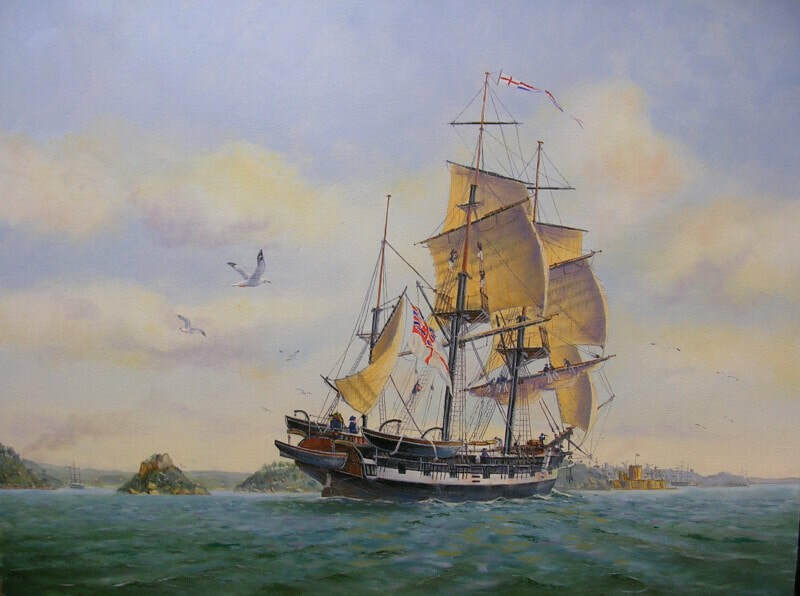 On 9 September 1839 the Beagle sailed into Darwin harbour - it was named by John Clements Wickham & John Lort Stokes for their former shipmate whose 'geologising' resonated in their memories. A few days after my interview with the natives, 'Mr. Fitzmaurice went ashore to compare the compasses. From the quantity of iron contained in the rocks, it was necessary to select a spot free from their influence. A sandy beach at the foot of Escape Cliffs was accordingly chosen. 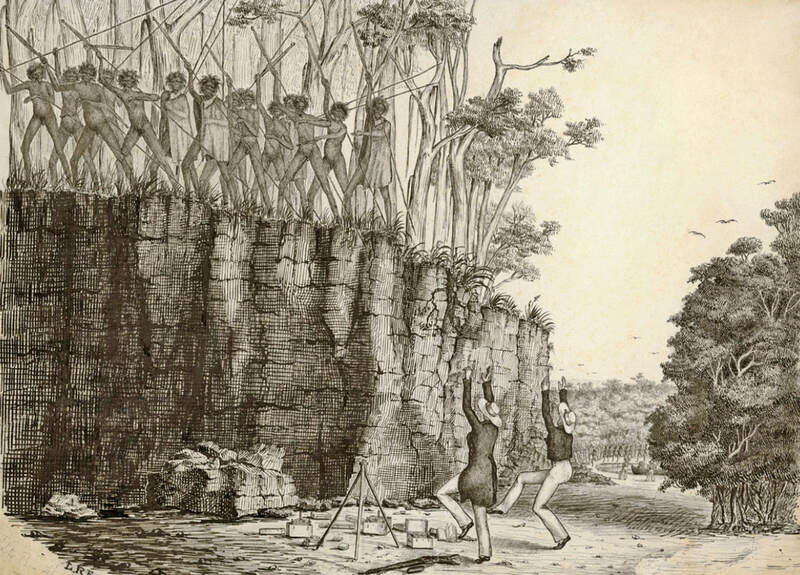 The observations had been commenced, and were about half completed, when on the summit of the cliffs, which rose about twenty feet above their heads, suddenly appeared a large party of natives with poised and quivering spears, as if about immediately to deliver them. Stamping on the ground, and shaking their heads to and fro, they threw out their long shaggy locks in a circle, whilst their glaring eyes flashed with fury as they champed and spit out the ends of their long beards. * (*Footnote. A custom with Australian natives when in a state of violent excitement.) They were evidently in earnest, and bent on mischief. 'Messrs. Fitzmaurice and Keys had firearms lying on the ground within reach of their hands; the instant, however, they ceased dancing, an attempted to touch them, a dozen spears were pointed at their breasts. Their lives hung upon a thread, and their escape must be regarded as truly wonderful, and only to be attributed to the happy readiness with which they adapted themselves to the perils of their situation. This was the last we saw of the natives in Adam Bay, and the meeting is likely to be long remembered by some, and not without pleasant recollections; for although, at the time, it was justly looked upon as a very serious affair, it afterwards proved a great source of mirth'. (John Lort Stokes, Discoveries in Australia) The sketch above is by Lewis Roper Fitzmaurice after whom the Fitzmaurice River near the NT/WA border is named. The Roper River is named for one of Leichhardt's party. Emery Point eastern entrance to Cullen Bay where Lieutenant Emery of HMS Beagle found freshwater. Close up of Emery Point looking east into Port Darwin. East Point - the western side of the point is the most logical site for the night landing rather than Nightcliff which would be difficult and dangerous. 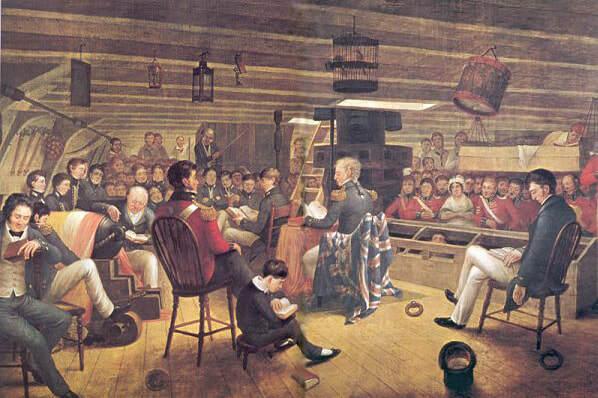 Lt. J. Stokes of HMS Beagle speared in the lungs while discovering the Victoria River in 1839 by Richard Bridges Beechey. NLA 134339536 after a sketch by Martens. VISIT THE SHORE FOR OBSERVATIONS. I left the ship in the morning to make some observations at Point Pearce for the errors of the chronometers. I was accompanied to the shore by Mr. Bynoe, who was going on a shooting excursion. It being high-water, I was obliged to select a spot near the cliffs forming the point, for carrying out my intention. That selected was about 60 yards from the wood-crowned cliff which rose behind; thinking such an intervening distance would secure me from the spear of the treacherous native. This caution rather resulted from what had before occurred at Escape Cliffs, where Messrs. Fitzmaurice and Keys so narrowly escaped, than from any idea that natives might be lurking about. Indeed, Mr. Bynoe had been shooting all over the ground yesterday, and had neither seen nor heard anything to indicate their existence in this neighbourhood; though doubtless, from what followed, they had been very busily watching him all the time, and were probably only deterred from making an attack, by the alarm with which his destructive gun, dealing death to the birds, must have filled them. Requiring equal altitudes, I was compelled to revisit the spot in the afternoon for the corresponding observations. The boat in which Mr. Bynoe returned to the ship, was to carry me on shore. We met at the gangway, and in answer to my inquiry, he informed me that he had seen no traces of the natives. He had shot a new and very beautiful bird of the finch tribe, in which the brilliant colours of verdigris green, lilac purple, and bright yellow, were admirably blended. * The time was short; half an hour would have sufficed for the observations, and we should have left the coast. As it was now low-water, and I had to traverse a coral reef half a mile in width, I resolved to lighten myself of my gun, which I had taken with me in the morning, that I might with greater safety carry the chronometer. On landing I directed Mr. Tarrant and one of the boat's crew to follow with the rest of the instruments. The walking was very bad, the reef being strewed with coral fragments, and interspersed with large pools. With my mind fully occupied by all we had seen of late, I hurried on without waiting, and reached the observation spot, just glancing towards the cliff, which presented nothing to the view except the silvery stems of the never-failing gumtrees. I had just turned my head round to look after my followers when I was suddenly staggered by a violent and piercing blow about the left shoulder:* and ere the dart had ceased to quiver in its destined mark, a loud long yell, such as the savage only can produce, told me by whom I had been speared. One glance sufficed to show me the cliffs, so lately the abode of silence and solitude, swarming with the dusky forms of the natives, now indulging in all the exuberant action with which the Australian testifies his delight. One tall bushy-headed fellow led the group, and was evidently my successful assailant. I drew out the spear, which had entered the cavity of the chest, and retreated, with all the swiftness I could command, in the hope of reaching those who were coming up from the boat, and were then about halfway. I fully expected another spear while my back was turned; but fortunately the savages seemed only to think of getting down to the beach to complete their work. Onward I hurried, carrying the spear, which I had drawn from the wound, and determined if, as I expected, overtaken, to sell my life dearly. Each step, less steady than the former one, reminded me that I was fast losing blood: but I hurried on, still retaining the chronometer, and grasping my only weapon of defence. The savage cry behind soon told me that my pursuers had found their way to the beach: while at every respiration, the air escaping through the orifice of the wound, warned me that the strength by which I was still enabled to struggle through the deep pools and various other impediments in my path, must fail me soon. I had fallen twice: each disaster being announced by a shout of vindictive triumph, from the bloodhounds behind. To add to my distress, I now saw, with utter dismay, that Mr. Tarrant, and the man with the instruments, unconscious of the fact that I had been speared, and therefore believing that I ​could make good my escape, were moving off towards the boat. I gave up all hope, and with that rapid glance at the past, which in such an hour crowds the whole history of life upon the mind, and one brief mental act of supplication or rather submission to Him in whose hands are the issues of life and death, I prepared for the last dread struggle. At that moment the attention of the retreating party was aroused by a boat approaching hastily from the ship; the first long, loud, wild shriek of the natives having most providentially apprised those on board of our danger. They turned and perceived that I was completely exhausted. I spent the last struggling energy I possessed to join them. Supported on each side I had just strength to direct them to turn towards our savage enemies: who were hurrying on in a long file, shouting and waving their clubs, and were now only about thirty yards off. Our turning, momentarily checked their advance, whilst their force increased. During these very few and awfully anxious moments, a party, headed by Lieutenant Emery, hastened over the reef to our support. Another moment, and ours would have been the fate of so many other explorers; the hand of the savage almost grasped our throats--we should have fallen a sacrifice in the cause of discovery, our bones left to moulder on this distant shore, would have been trodden heedlessly underfoot by the wandering native.